Bowling Green’s loss just might turn out to be the Terriers’ gain. Sophomore forward Jacob Cepis, who left the Falcons last month, is seeking to transfer to a non-CCHA school. Published reports indicate that BU is among the front-runners for the 5-8, 165 lb., left-shot center-wing whose 15-16-31 line in 38 games earned a spot on the CCHA All-Rookie team. This season, Cepis has struggled, scoring one goal and four assists in 18 games. According to a Sentinel-Tribune article flagged by the Western College Hockey blog, UMass and Denver are the other schools rumored to be top contenders for Cepis. Wisconsin is another school reportedly interested in Cepis, however he denied having spoken with the UW coaches in a Dec. 20 BadgerBeat.com story. If he enrolls in college for the spring semester, Cepis will be eligible to play in January 2010. 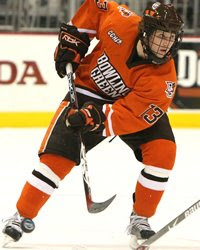 Prior to Bowling Green, the Parma, Ohio, native, spent two seasons with Cedar Rapids in the USHL, where he led the league in goals with 38 in 2006-07. Cepis also spent one season in the NAHL with Cleveland. "He's a special offensive player. He has that combination – being very quick but having the skills to go with it. He's got a knack to score and a good understanding of when to jump into holes, and has the confidence to score goals."